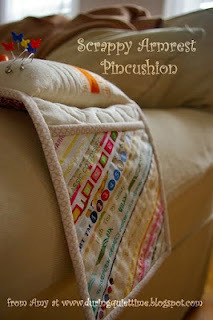 Amy at During Quiet Time has a great tutorial to create this Scrappy Armchair Pincushion. It's a quick and easy project perfect for using those selvages you've been saving or using some of your scrap stash. Great gift for the seamstress or one who does hand sewing, embroidery, cross stitching, etc. For complete instructions, simply click on the photo above.